Well comrades, what a cracking start to MNFC in 2012 we had last night! Adam was the Dictator of the Week, and kept us all well fed with Adam’s Epic Beans™, a stupendous medley of beans, pulses and vegetables that was almost enough to make vegetarianism seem appealing. Still, would’ve been even better with a few sausages. 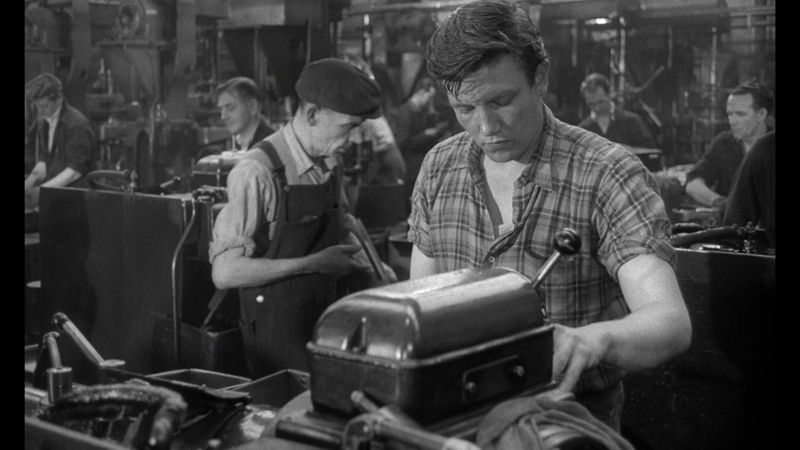 The night’s feature was Saturday Night and Sunday Morning, a gritty black and white film about the working class in Nottingham in the late ’50s and early ’60s. The (anti-)hero was Arthur Seaton, an angry young man pushing back against the confines of a factory job and the prospects of ending up just like his father by drinking copious amounts of beer and stout (in the same glass – yuck! ), challenging passing sailors to drinking contests and messing around with married women. But was he Britain’s equivalent to James Dean or, as the director Karel Reisz described him, a “sad person, terribly limited in his sensibilities, narrow in his ambitions and a bloody fool into the bargain”? Will he settle down into married life in a bungalow, or will he continue to throw stones (1:22:45)? The film was based on what is considered to be an autobiographical book of the same name by Alan Sillitoe, himself an Angry Young Man from Nottingham, and is often classified as part of a British New Wave movement in cinema. This movement was revolutionary in the way it featured working class protagonists, and tried to depict the lives of the British working classes as they really were. The film and Silitoe’s writing still have relevance today, as evidenced by this Guardian article published after the violent actions of our own contemporary angry young men and women last year attempts to show (not very well if you ask me, but hey ho). Albert Finney as Arthur was full of swagger and rebellion, throwing out such gems as “Don’t let the bastards grind you down! ” and “I’m out for a good time – all the rest is propaganda!”, a far cry from his later roles as Daddy Warbucks and Ed Masry. Luckily for us, his performance in the film inspired another set of angry/cheeky young northern men, Arctic Monkeys, who took the title of their first album Whatever People Say I Am That’s What I’m Not from another Finney/Arthur quote. Arthur’s attitude possibly inspired the lyric “It’s wrong, wrong, wrong, but we’ll do it anyway, cos we love a bit of trouble”. The chin-stroking portion of the evening was quite fruitful, as we covered topics like abortion, whether Matt’s childhood in Sheffield mirrored Reisz’s Nottingham, and pondered just how northern is Nottingham? The accents of the characters certainly covered a wide geographical area; I personally thought Brenda was suppressing Scouse, whilst Aunt Vera was definitely East Lancs. Attendees will be pleased to know that Avis Bunnage went on to have a long and fruitful acting career, including a long stint on Coronation Street. The discussions also revealed a hitherto hidden anti-northern prejudice in Comrade Love, which should probably never be spoken of again in the interests of group harmony. Oh dear, I’ve just spotted that it’s no longer Tuesday! However, I’m comforted by the fact that you’ll need to revisit this review later in the week anyway to make up for the fact that you won’t be able to access any of the Wikipedia links on Wednesday because those pesky folks that run it are staging a protest blackout, so it was always going to be more of a Tuesday to Thursday Review! Next session is on the 6th Feb in my humble home, and will be our first birthday celebration! Feel free to bring (me) presents. Until then, for those of you keen to find out more about the making of the film here is something to watch; for the rest of you, keep throwing stones (but not at dictators). THIS IS NOT A DEMOCRACY!!! Great Tuesday Becca, and great Saturday Night Sunday Morning on a Monday Evening Adam. I just wanted to clarify, as an adopted Yorkshireman, my spiritual home is now the north! In fact, lest not forget it was I that introduced the town of Rotherham to such cultural delights as electricity, the wheel and soap. But my point stands to reason… the social realism films, and those they gave rise to in the 70’s-90’s, were all set in the north. We had our own troubles down here… Fleet was just awful before they built the Hart Shopping Centre. My big book of film that I got for xmas, discusses this a bit. Reisz, Richardson and Lambert all worked on Sequence magazine for Oxford Uni, and then went on to write for Sight and Sound. But given their Oxbridge backgrounds, some critics were sceptical about the authenticity of the new British Wave films. An article in the Guardian derided the way these southern, middle-class filmmakers gazed northwards, seeking ‘the tougher living and richer accents which suit their sociological tastes’. Then, they all buggered off to Hollywood as far as I can tell (other than Anderson’s …If). So hypocritical or earnest? Using their wealth to tell the stories of the less fortunate, or to make a name for themselves? Patronising or revolutionary? PS. Had a quick look to see if anyone else had noticed the bicycle thieves similarities. Well, they hadn’t. But, it seems bicycles are very under-represented in cinema, and this article quotes both Saturday Night and Bicycle Thieves as good examples. And E.T., out of interest. But, no mention of BMX bandits – surely the epicentre of all bike-related social realism.